Hi again from Suz & John, direct from Gardiner Montana, about 1 mile north of Yellowstone National Park! The photo at left was taken on our way from Livingston Montana to Gardiner. Such spectacular countryside! I have been to Montana several times, and each time it somehow grips me in it’s natural beauty. You may have seen many photos of Montana, but seeing it in person is a special experience – to me anyway. Yesterday, day four, was a travel day. We got a late start and when it came time to hook up the car to the motorhome it took longer than day one. We discovered that we didn’t have it exactly right the first time, and so with a little extra effort, we did get it right yesterday. We lost an hour when driving into Montana and that contributed to us arriving in Deer Lodge rather late. We gassed up in Missoula and this time we were able to calculate mileage. It wasn’t as good as we’d hoped, but not too bad considering the mountainous terrain we encountered. (8.3 mpg) We arrived in Deer Lodge about 6:30 pm – just in time to hook up everything prior to another rain storm. I made a yummy dinner of Asian pork and noodles with snow peas and broccoli (one of our favorites)… before we knew it, it was bedtime. This morning we got going much quicker! We didn’t need to hook up the car as we’d left it connected overnight. We were on the road by 9:30 am. We arrived here at Rocky Mountain RV Park about 2pm, in the middle of a hail/rain/wind storm. The funny thing about weather in this part of the USA, it literally changes minute by minute. After unhooking the car (also known in RV language as “the toad”) and hooking up our electric, sewer, cable, and water, we snapped this picture. Yep, the clouds were gone, replaced by beautiful blue skies. We drove from the RV park into the town of Gardiner in our little car, just to “check it all out”. 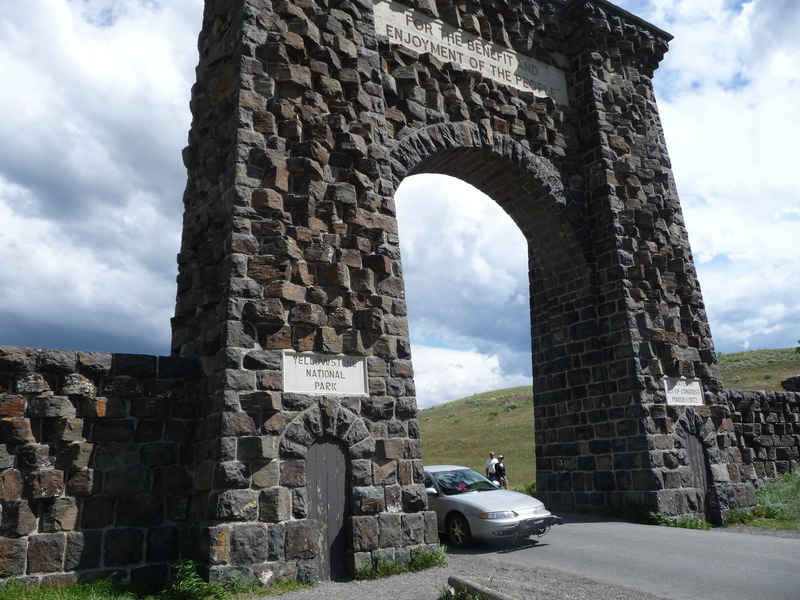 We stopped at the local grocery store, picked up a few items we needed and then drove to the Roosevelt Arch, the original entrance to Yellowstone Park. Way back in the early 1900’s, tourists would disembark from the train and get into stagecoaches that carried them through the arch and into the nation’s FIRST national park. Here is a picture I took after asking John to turn the car around and head back out through the arch. Our little car making it’s way through this very famous landmark! Tomorrow will be our first day exploring this national treasure! I am so thrilled that we have three full days here to take it all in. More photos will follow, no doubt. The locals say that the weather is supposed to get nicer and nicer – now that would be awesome. And now, a few words from my dear hubby (the motorhome chauffeur) whom I wish a VERY happy Fathers Day today!! I’m not quite sure what to add really, except that I love the coach, it drives like a dream, I almost feel like I could leave it in cruise and climb in the back and take a nap!…kidding of course. I’m not too unhappy with the fuel mileage through the mountains, if we maintain our 10mpg “on the flat” I will be very happy. We have had a chance to check out many of the systems we have on board including the furnace and so far they all work as designed, except the backup camera which is being temperamental, sometimes it works and then it doesn’t, I’m sure its an easy fix, a loose connection or something. 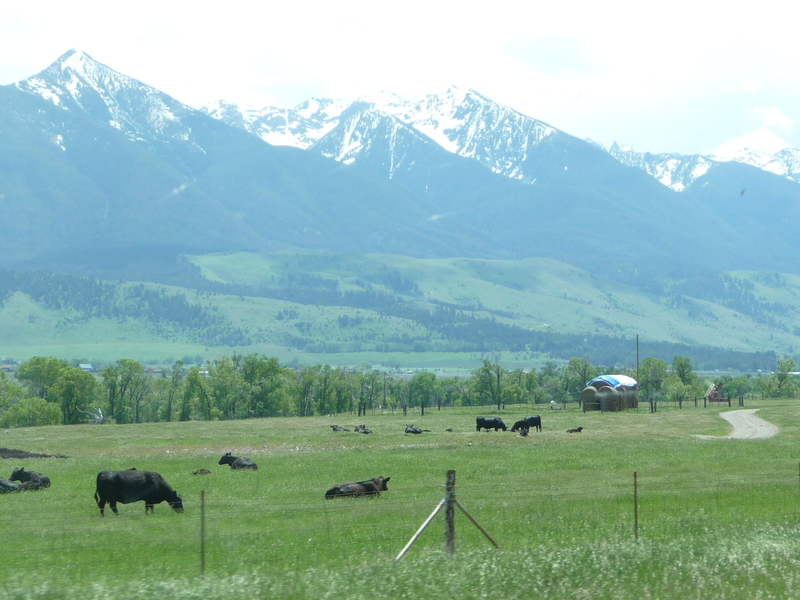 Montana is beautiful, rolling green hills and snow capped mountains, wonderful scenery. I am keeping up with all the sporting events and with an Irishman leading the open, England about to win the world cup, a beer in the fridge, my own personal chef as we travel through the western US….. what more could a man ask? 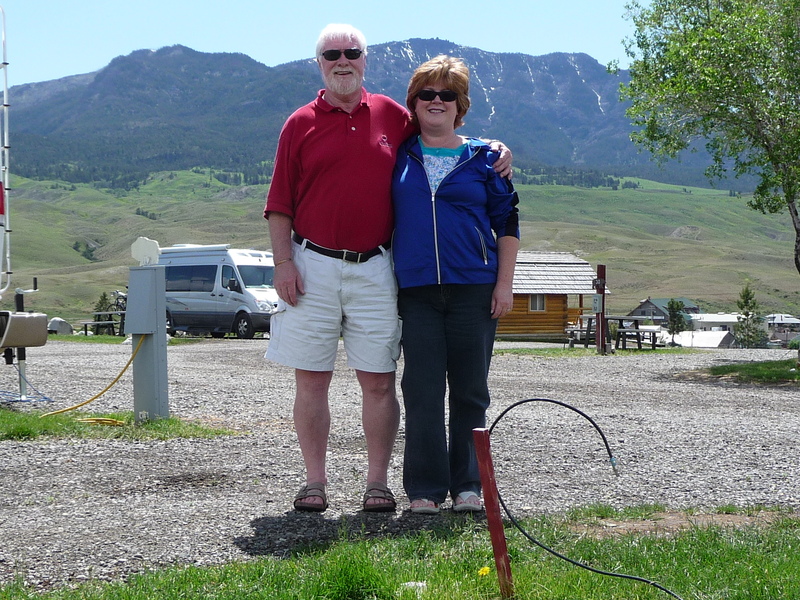 This entry was posted in Winnebago Journey and tagged motor home trip, Yellowstone National Park. Bookmark the permalink. ← Day three, the sun reappears! Oh boy can’t even spell soccer! !